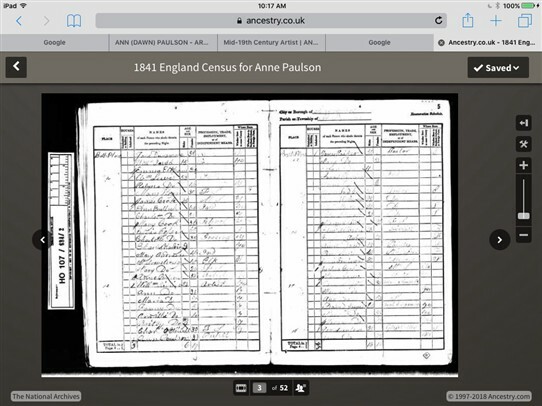 I am in New Zealand, and I am distantly related to Ann (Dawn) Paulson through my great grandmother, Jane Dunnell, (my runaway bride) who left her home and married Henry Maxwell David Mathews in Sheffield. Their marriage is mentioned in the book "Mansfield's Lady Victorian Artist". I have done a lot of research about Ann on this site, and found even more Australian resources and info on Trove, Australia. On reading about her on here, I see that she was not in the 1841 Mansfield census, but can happily tell you that she was in London at that time, listed as an Art Student! See image below. This page was added by Jeanne Mathews on 27/11/2018.